News: the Stedelijk Museum in Amsterdam has acquired Solid C2 by Patrick Jouin, the first item of furniture to be 3D-printed in one piece. "The Solid chair was the first furniture piece made with the SLS [selective laser sintering] technique in one piece," says the museum's curator of industrial design Ingeborg de Roode. "It clearly shows the possibilities of this technique to make very complicated structures." This is the first 3D-printed chair in the collection of the Stedelijk Museum - whose bathtub-like extension we featured last autumn - and the curators have chosen to buy it in red. The museum also holds two One_Shot.MGX stools by Jouin from 2006, five Snotty Vases by Marcel Wanders from 2001 and a Miss Piggy ring by Ted Noten from 2009. We visited Materialise Leuven, Belgium, as part of our road trip for Print Shift, our one-off magazine about additive manufacturing. 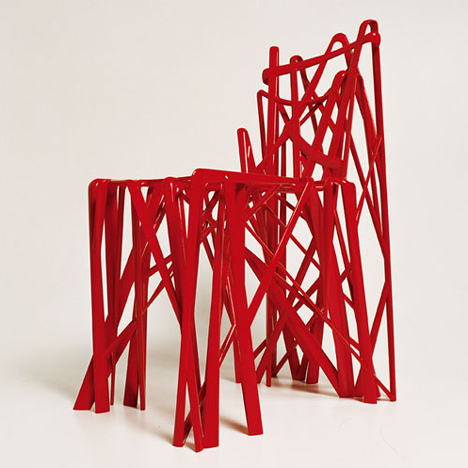 .MGX is thrilled to announce that a red Solid C2 chair by Patrick Jouin has been selected to join the permanent collection of the Stedelijk Museum in Amsterdam. Patrick Jouin is one of the major protagonists of contemporary design on the French and international scene. In 2004, Jouin first became aware of 3D Printing which until then, had only been used for small ‘scale models’ in plastic. Together with .MGX, Jouin took the entire process to a previously unheard of level, creating forms that were once thought impossible to produce. The Solid C2 chair was among these first designs and is reminiscent of blades of grass waving in the wind and weaving together. Founded in 1874, the Stedelijk Museum is a leading modern and contemporary art museum with a collection featuring some of the greatest artists of this century and the last, including: Andy Warhol, Jackson Pollack, and Vincent van Gogh.